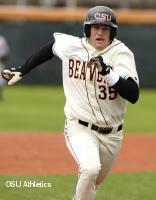 Release: 03/17/2007CORVALLIS, Ore. – John Wallace’s three-run homer highlighted Oregon State’s seven-run first inning as the fifth-ranked Beavers beat San Francisco 9-2 in non-conference baseball Saturday afternoon at Goss Stadium at Coleman Field. Mitch Canham added a two-run homer and Joe Paterson pitched six innings for the win for OSU (19-3 overall), which now has a season-high eight-game winning streak. OSU and San Francisco (9-11) complete their series Sunday at 12 noon. The game can be heard live on KEJO-AM (1240) in the Corvallis area and delayed at 3 p.m. on KUIK-AM (1360) in the Portland area; it can be heard live in Spanish on LaX Sports. Live internet video and audio is available via subscription on www.osubeavers.com.On Saturday, the Beavers clinched the series win against the Dons – the defending West Coast Conference champions and stayed unbeaten in five home games this season. OSU has scored 20 runs and had 24 hits in the first two games of the weekend. San Francisco took the lead on Jonnie Knoble’s solo homer in the top of the first inning, then Don righthander Jason Dufloth retired the first two Oregon State hitters in the bottom of the inning. But the Beavers then came up with seven runs on six hits and a pair of walks, getting a two-run single from Jason Ogata, a run-scoring single from Jordan Lennerton, Wallace’s three-run homer, and a run-scoring triple by Darwin Barney. Wallace’s first career homer, a three-run drive over the rightfield fence, put OSU up 6-0. USF lefthander Cole Stipovich entered the game with the score 7-0 in the bottom of the third inning and retired the first 12 Beavers he faced. With one out in the seventh, Mike Lissman doubled down the leftfield line and then Canham homered for the second straight game. His blast to the centerfield side of the scoreboard in right-center was his fourth homer of the season and put OSU up 9-2. After winning for much of the early season with pitching and defense – OSU has held opponents to three or fewer runs 14 times in its first 22 games – the Beavers have now slugged the ball in back-to-back games. Lennerton’s single in the first inning pushed his hitting streak to six games, while OSU’s Drew George saw his hitting streak end at six games. Paterson improved his record to 4-1 this season. In his six innings, he allowed two runs on eight hits and no walks while striking out four. Jorge Reyes pitched a pair of scoreless innings and Mark Grbavac blanked the Dons in the ninth to finish the game for OSU. USF’s Dufloth, who had entered the game with a 3-2 record and 2.82 earned run average, took the loss; in 2 1/3 innings, he allowed seven runs on seven this and three walks while striking out one. The 2007 tournament will feature eight teams. IF THERE ARE ANY QUESTIONS, PLEASE CALL PETE SAVAGE AT 828-4193. Balls: Each team provides 3 baseballs at the start of each game. Each team is responsible for chasing foul balls on their side of the field. Run Rule: 10 Run Rule after 5 Innings. Thank you for playing in this year’s tournament. It should be a great tounament. The championship game will be played at Reno High School at 3:00 PM on Saturday, March 10. If there are any questions, please call Pete Savage at 775-828-4193.